So glad you did this B&W. 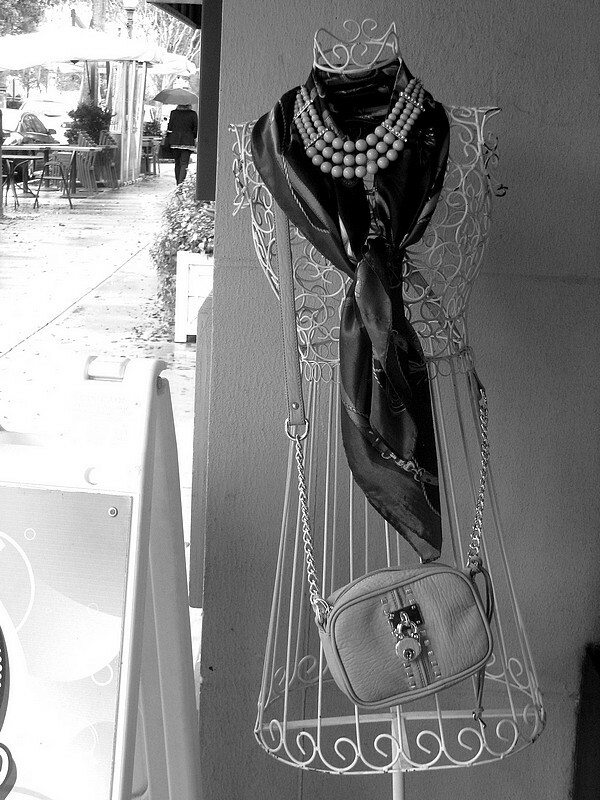 Ooh La La … fabulous capture, Carin, all the more so in B&W! That’s very Audrey Hepburn heheh! Something about a wire dress frame… I think anything you put on it looks interesting. a very nice capture for this wordless wednesday. I’m not reading the comments above (yet!) because I want the mystery to linger. I love the black and white of this, and all the detail, the “victorian” wire figure so cleverly “dressed” and then the intriguing view to the left of the composition. Very satisfying! Ah, and when I enlarged it I saw that it is raining out on the street. That passing umbrella is a lovely touch both of shape and of atmosphere. That umbrella is my favourite bit! Of course I didn’t see it when I took the pic.